Photo from the film "Let Them Eat Cake"
"Not the Cup of a Carpenter" by Nancy Rodwan. Detroit artist Nancy J. Rodwan responded to Donald Trump's election by breaking a cup. 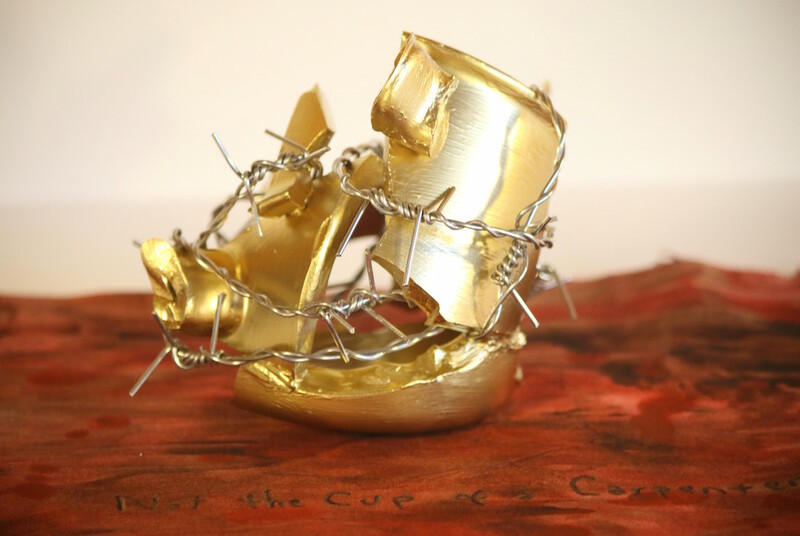 She then turned it into art, gluing some of the pieces together, spray-painting it in "tacky Trump gold" and and wrapping it barbed wire in a piece titled: "Not the Cup of a Carpenter." "Freedom of speech is trapped in the barbed wire," she said, explaining that she fears the First Amendment will come under a full-throttle attack under the Trump administration. Rodwan's piece will be among the art exhibited Jan. 22 -- two days after the presidential inauguration -- from 1-3 p.m. at the Tangent Gallery, 715 East Milwaukee Ave. Rodwan is a co-curator for the free event. 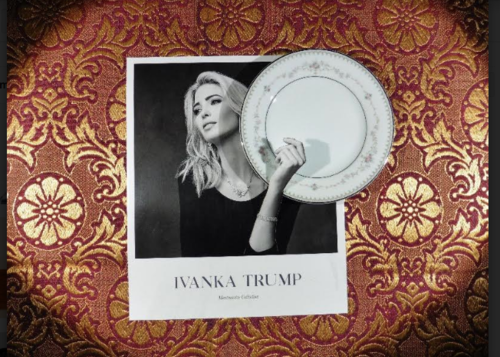 Titled "The Uninvited, the exhibit will feature a massive table with sculptural place settings that make a political statement about the coming era of Trump. Artist works will be displayed on the table, including a short film, "Let Them Eat Cake," that will be shown on a computer. The film is being produced by Gary Schwartz, an Academy award-nominated filmmaker, award-winning animator and director, artist and educator. "It’s basically each artist responding to the news of the administration," Rodwan says. "There’s a lot of fear and anxiety about Trump and his appointees." Other contributors include mixed media artist M. Saffel Gardner, ceramic artist Barbara Barefield, fiber artist Mandisa Smith and writers Vickie Elmer and Desiree Cooper. Spoken word open mic performances begin at 2 p.m. Detroit hip hop artist Mahogany Jones will emcee the event and perform, along with rapper Dominique Rhodes.